You’ve been hearing about Southern California’s ongoing drought for years now…the worst drought in California history. Now Californians have been facing a totally different but equally challenging situation. Over the last few months, Southern California has received more rain than it had in the several previous years combined. 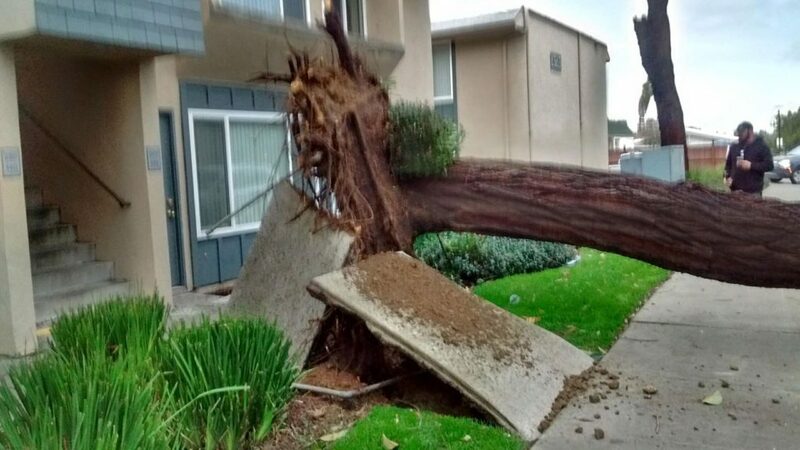 Heavy rains, flash floods and high winds have overwhelmed trees and landscapes across San Diego County and Southern California, leading to millions of dollars in property damage. So what can you do to prepare and protect your trees from the unusually wet, windy weather? The combination of drought-ridden soil and immediate heavy rains can spell disaster. The ground soaks as much water in as possible, but the rest will pool up and possibly flood your landscape. This can cause tree roots to become unstable and lead to fallen trees, especially when paired with the high winds we’ve been experiencing. Your trees should be inspected for broken branches, signs of a weak root structure, or other signs of a potential tree hazard. Weak, twisted, broken or dead branches should be removed before they snap and fall. For dead trees or those at serious risk of falling, you should strongly consider tree removal. If you’ve lived in San Diego long, you’re very familiar with Santa Ana winds. 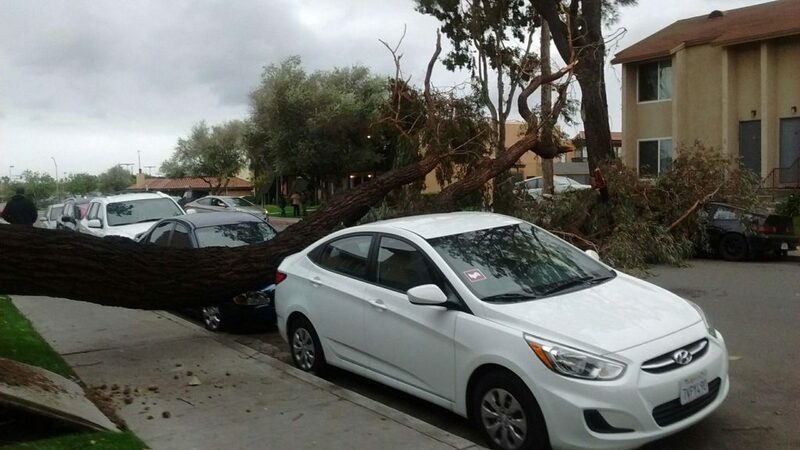 However, the winds we’ve experienced with the recent storms have been up to 3 times stronger than Santa Ana winds. When a tree has a canopy that is thick and full, the canopy can catch the wind almost like the sail of a sailboat. This “sail” effect can lead to an otherwise healthy tree being blown over. Healthy trees with a nice, full canopy are good candidates for tree trimming and lacing to allow the wind to flow through the canopy instead of catching the air and potentially falling. Your trees and landscape have weathered years without regular water, and the effects of heavy rain and high winds are greatly multiplied. As a result, trees become susceptible to disease and infestation when they are weak (just like humans when our immune system is weakened). It is not uncommon to see a seemingly healthy tree die shortly after heavy rains and storms, because the tree was weakened from the drought and then further weakened by the storms. Your trees should be inspected by an arborist for signs of broken branches, infestation, disease or other hazards. If a tree is found to be a hazard, it is a perfect candidate for tree removal. When we’re talking about tons of wood possibly falling onto your house, car or landscape, being prepared can make all the difference. Your list of emergency contacts should include your neighbors, electrician, plumber, insurance companies, and of course a 24/7 Emergency Tree Service. You can contact us day or night to report a tree-related emergency and get the expert help you need to assess the damage and provide the necessary services to help you move forward. Do your trees need to be inspected, trimmed or removed? Please contact us today for a free tree service consultation and estimate.